That experience put me off Telltale games for a couple of years. It seemed like the type of adventure game they were intent on making was extremely at odds with the type of adventure game that I liked to play1, so I stayed away from them. However, after getting numerous recommendations that I should play Tales From The Borderlands (and these weren’t just “It’s pretty good” recommendations either, it was full on “This is my game of the year!” stuff) I decided to dip my toe back in. Perhaps if I went in with substantially lowered expectations – above all, not to expect anything at all from the choices the game would present me with — I could get a bit more out of Tales than I did The Walking Dead. This turned out to be a great approach to take. 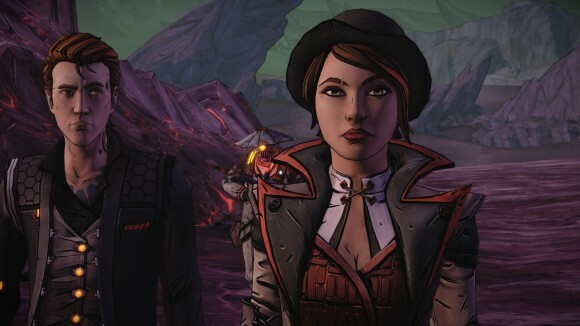 Tales From The Borderlands is an absolutely stonking story which follows a pair of main characters: Rhys, an ambitious middle-manager from the Hyperion corporation, and Fiona, a fast-talking Pandoran con-woman. The two collide during a back-channel deal to acquire a Vault key that forces them to become uneasy allies in the cause of tracking down the Vault whilst avoiding bounty hunters, ruthless corporate stooges and the more unsavoury bandit elements on Pandora. Cue various misadventures in which you alternate between controlling Fiona and Rhys – sometimes working together, and other times at complete loggerheads — as you make your way through ten hours of what is now the standard Telltale gameplay of conversations-and-cutscenes. If none of what I just wrote means a huge amount to you (Vaults? Hyperion? Pandora?) then I wouldn’t worry: Tales From The Borderlands is commendably non-reliant on knowledge of the previous Borderlands games. Some of this stuff is just a macguffin to drive the plot forward, and it does a good job of explaining the rest of it – I’d forgotten nearly everything from the two Borderlands titles that I’d played (except for Handsome Jack) but after a mildly uncomfortable opening half-hour where I struggled to remember what was and wasn’t important, I eventually realised that it didn’t matter. The Borderlands games have always been rather weak on actual plot, and Tales is very intent on using the best aspects of their cartoon setting to do its own thing. 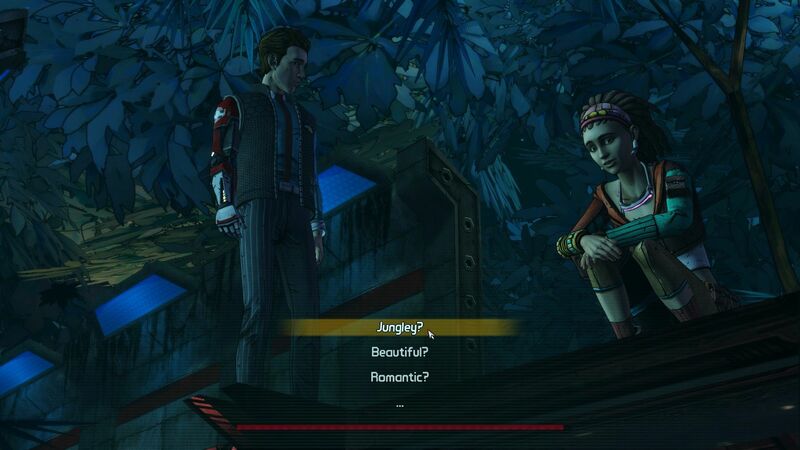 There is one semi-important plot point that gets resolved off-screen in Borderlands: The Pre-Sequel (which is the one I haven’t played) which I found more than a little annoying, but on the whole it’s possible you might get *more* out of Tales if you haven’t played a Borderlands game before as you won’t have that weird adjustment period at the start and can just enjoy it for what it is. 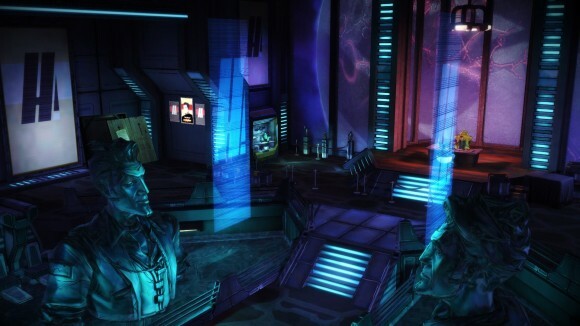 The setting suits what Telltale is trying to accomplish here, too. I wouldn’t have previously chalked Borderlands up as a world crying out for more detailed exploration in an adventure game as it was only ever concerned with providing you childish reasons to shoot the next bad guy and get some loot, but in a way that’s precisely why it works: it’s so one-dimensional Telltale can do just about anything they want with it, and so ridiculously over-the-top Telltale can *really* do just about anything they want with it. 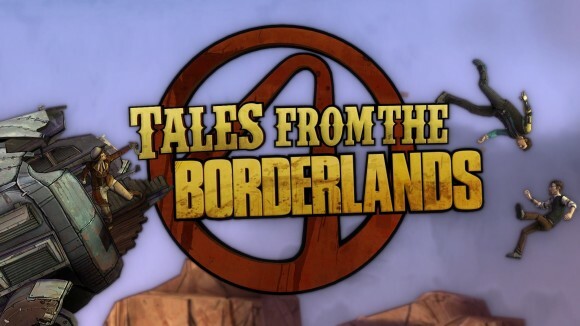 Tales is very well-written, with a cast of strong characters that you form genuine attachments to over the course of the story, and a sense of humour that hits far closer to the meta-esque stylings of Archer that the main Borderlands series was shooting for. In fact if I had to describe Tales in one sentence, I’d say it’s pretty much a 10-hour long episode of Archer when Archer was in its prime (circa season 2), when it had just hit its stride and hadn’t yet collapsed under the confusing weight of its own self-referential humour. It’s also incredibly well-directed. That’s not something I usually say about a game, but since Tales is more of an interactive movie than it is a game it does let Telltale do some really, really inventive things with the camera (when you’re playing it) and with the cinematography (when you’re watching a cutscene). The intro sequences to every one of the five episodes – each of which is a montage set to some excellent choices of licensed music — are nothing short of works of art, and far better than anything I’ve seen out of an AAA title this year. There’s a lot of re-use of assets from the Borderlands series, but this is only fair; the only real complaint I can make about the way Tales looks is that it’s using the same engine as The Walking Dead did three years ago, and that thing was creaky as hell even back them. Time has not improved it any, and while the cartoon art style again comes to the rescue to paper over the basic limitations of what the engine can do, there’s still several scenes where it’s obvious the game team are struggling against those limitations to tell the story that they want to tell. 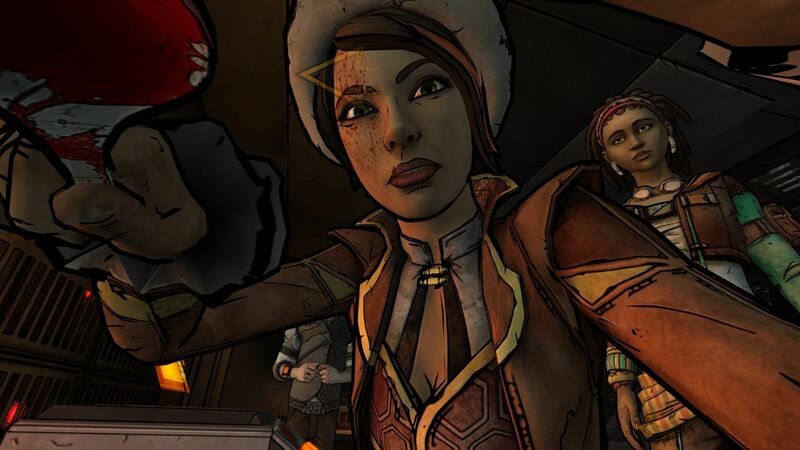 Now, about the “game-altering” choices that have been the questionable hallmark of every Telltale game since The Walking Dead: fortunately this time I knew what to expect and went into Tales with very low expectations, which meant that I got nowhere near as irritated with it as I did TWD. It helps that the stakes are much lower; Tales is a much more upbeat series in tone, and while it does have time for some serious and particularly heartbreaking moments (like the entire introduction sequence to Episode 5) there’s never really a point where you have to make a decision that is life-and-death for a given character. As with TWD you’ll end up in the place where the plot wants you to end up and with the people it needs you to end up with; what your decisions change is how you get there, and Tales is at least a little inventive in how it varies the story according to the conversation choices you make. The broad narrative beats and important plot points are the same, but you have enough latitude to make the story your own through control over the little details – and some of the choices *do* come back to haunt you in the final episode, when certain characters are available to help (or not) depending on how you treated them during the rest of the game. If I have one genuine issue with the choices it’s that Tales isn’t particularly good at justifying how it railroads you back on to the main storyline, resulting in some rather convoluted reasoning as to why (for example) the bad guys aren’t just shooting you in the face after you refused to ally with them. Again, though, because it’s Borderlands I had trouble taking this quite as personally as I did when TWD pulled the same stunt. I have a more serious complaint about the gameplay outside of those conversation choices, however, because it’s pretty much non-existent. Probably 70% of Tales is either a cutscene or a conversation dialogue; another 20% are some admittedly well-judged quicktime events that are played mostly for laughs (and which don’t have a failure state, as whoever you’re controlling out of Fiona or Rhys will do the thing anyway if you don’t push the button); and the final 10% is the walking-around-interacting-with-bits part that used to constitute the majority of traditional adventure games. Even during these sequences there is nothing in Tales that even remotely resembles a puzzle, and they’re used as an opportunity to crack even more jokes, some of which are quite subtle2. So pretty much the entire game is one big ten hour long interactive cutscene. That’s the sort of thing that *could* have gone horribly wrong if Tales wasn’t quite so charming and funny as it’s turned out to be; I’ve lambasted plenty of FPSes for pulling exactly the same thing and while the adventure genre is at least more traditionally structured around a strong narrative I think I’d be far harsher on it if the quality of that cutscene wasn’t so damn high. As previously mentioned, some of the directing is so strong they could easily screen this thing on television as a miniseries and I’d happily sit through every episode of it completely hands-off – the ability to influence the narrative in small ways here and there is just a nice bonus. This is how Tales neatly sidesteps my fundamental issue with Telltale adventure games outlined in the opening paragraph: by being good enough as a narrative that I didn’t care that it wasn’t actually much of a game. It’s not afraid to cut loose with silly jokes and some ridiculous QTEs (Episode 4’s “gun” fight and the entirety of Episode 5’s ending spring to mind), yet at the same time it never lets these over-the-top sequences eclipse the story it is trying to tell, which has a lot of heart and a surprising amount of pathos. Calling it my GOTY would be overselling it more than a little, but it’s more than enough to get Telltale back into my good graces. And considering how irritated The Walking Dead made me? That’s quite an accomplishment. I’ve played all the episodes except the last hour of Ep. 5 (yet to find the the time) and have to admit that I’m liking this very much. There has definitely been a bit of Telltale fatigue for me, even though I played every one of their games since TWD Season 1 up to Tales from the Borderlands and GoT. My hopes for each game were just too high most of the time, the only Telltale game I ended up liking a lot was Wolf Among Us, which greatly stems from the superb atmosphere. TftB would be my number 2 I suppose but after GoT’s last episode I won’t touch any of their future games until the world that the game is set in interests me enough or they change the formula. If characters and/or story don’t grab me and tug me along I tend to get annoyed really fast by the very restrictive gameplay which is why I’m skipping Minecraft altogether. I’m definitely excited to see what the last hour of TftB has to offer. Should you ever reconsider playing any of the TT games you skipped I’d recommend you try out Wolf Among Us. In my opinion that one’s is fairly good if not very good. I have to admit my objection to Wolf Among Us stems largely from the source material. Fables was an excellent comic up until, oh, about issue 30-ish, and then went *completely* off the deep end. I just can’t take anything based on it seriously after that. I’d probably have had the same problem with the Walking Dead or GoT if I actually watched the shows. At least Borderlands offered them something of a blank canvas. I played the first episode and didn’t find it especially funny, so I still haven’t gone back. I also haven’t played more than the first episode of Game of Thrones. I’m not sure I like Telltale’s games that much, though I did like Until Dawn, which is the same thing, so I don’t know what the deal is. Good call on Archer, but I’d say the bigger issue is that, in spite of the out-of-control self-referential writing is the fact that the show has also abandoned much pretense at ongoing plotlines. Remember how the identity of Archer’s father used to be an important subplot? The first episode is definitely the slowest one; it does pick up later. Although if you weren’t hooked by the demolition derby finale then it might not be for you regardless. As with most creative enterprises Archer exhausted most of its good jokes comparatively early on (up to the end of season 3, so it’s not like it wasn’t absolutely killing it for a while) and while I respect its recognition of that fact and attempt to change things up during season 5 it wasn’t going to maintain that level of quality without something else to fall back on. And as you say, ongoing plotlines isn’t it. I haven’t made it to season 2 of Archer yet, but I thought Tales from the Borderlands was pretty special. As with all Telltale Games, it seems you have to switch off that part of your brain that analyses and pulls back the curtains on the game in order to get the most enjoyment out of it. Yeah pretty much. Borderlands at least made that very, very easy for me to do – I’m far less likely to pick holes in it that I am GoT or The Walking Dead. P.S. Watch seasons 2 and 3 of Archer, and then jump ship. That way you’ll only remember the best of it. I honestly can’t understand how Telltale can sell those “interactive stories” with an engine like this. Ok, they’ve missed Crysis 1 that came out in 2007 and introduced SSAO, advanced shaders and all of this fancy stuff. But the animation. Oh god the animation. Walking Dead tried to squeeze emotions out of me but it horrified me with animation worse than, say, Final Fantasy 8 from freaking 1998. It worked fine with their earlier games like Sam & Max and Monkey Island – the ones with an actual gameplay so you could do something, not just watch. Also it’s obvious that choice & consequence is directly in conflict with the very idea of episodic game. It’s kinda like watching the second episode of Star Trek and seeing Pickard in a dangerous situation. Sometimes they give you good decisions that do not matter and are still very interesting – mostly moral ones or dialogs like Game of Thrones ep 1 ending. Seriously, 1st episode of Telltale’s Game of Thrones is the only thing they’ve produced worthy of title “interactive story”, cause it really felt interactive and had a good story in it. Anyway, thanks, I’ll try Borderlands. Don’t care about original games but if your description is right it’s the only way Telltale can go with their tech. They can’t produce anything except cartoonish models moving in a cartoonish way so they should go for comedy – even if their jokes became boring and predictably ironic in a spoiled style of Josh Wedon after couple of seasons of Sam & Max. I’m willing to give Telltale something of a pass on the tech side because that’s clearly not their focus (and in Borderlands’ case the writing is good enough that it’s easy to overlook), but while I’ll happily tolerate it looking somewhat basic I’m absolutely baffled as to why the engine still slows down with juddering framerates at certain points in the game when I’m throwing a much beefier PC at it. They’re going to have to replace it soon. Fortunately I have not played their attempts at Monkey Island or Sam and Max. I know it would only have made me angry. Yeahhh don’t do it. Back to the Future was tolerable mainly because no-one had ever tried it and there was a cameo by Michael J Fox but.. Come to think of it, Jim wrote about them perfectly on his 2012 blog. Back to the Future was bad. They also tried making Jurassic Park and that’s where they’ve tried making Heavy Rain first. It was awful. You had QTE galleries giving you gold medals for your performance. I think Sam & Max were good games, especially latter ones. Monkey Island was meh but still fun. All of those were classic adventure titles and suffered for it – cause most puzzles were applying squid to shovel for progression.